What is the ‘Prep Test’? Many of my pupils start working on the Prep Test within their first year of learning the piano. This is their first glimpse into the formal examination setting of the Associated Board of the Royal Schools of Music (ABRSM). The ABRSM is the main music examining board in the UK but other popular examining boards are Trinity, Victoria College and Rockschool. Many pupils and parents prefer to follow the ABRSM grades as these are the best recognised qualifications and the higher grades count for additional UCAS and/or QCF points. 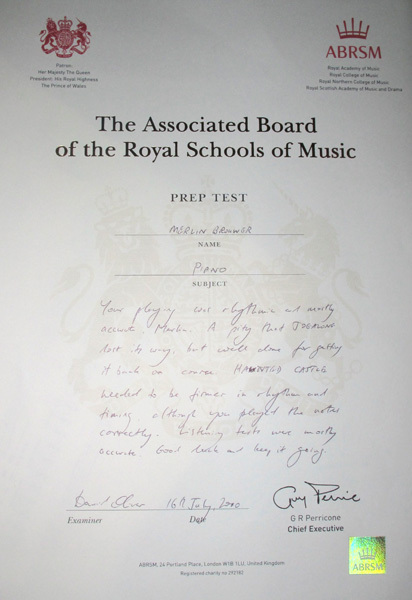 The Piano Prep Test has been specially designed to be taken by pianists who have been playing for a few terms. Built into it are the sorts of skills they will be developing at this stage, such as a sense of pitch and rhythm, controlled and even playing, accuracy and quality of tone. The Prep Test book contains all that the player will need to sit the test, explaining how each part will help in the development of their musical skills and giving advice on what the examiner will be looking for. See below for the first page of the book (click for a larger image). Click here to buy the book online. The exam lasts approximately 10 minutes. The pupil will enter the examination room on their own and will receive a certificate before leaving the room with constructive feedback and encouraging comments. The test is not pass or fail, all students are awarded a certificate with helpful and encouraging comments. It is a gentle introduction to the graded exam system. This entry was posted in ABRSM Prep Test, Associated Board of the Royal Schools of Music, Exams and tagged ABRSM Prep Test, ABRSM Prep Test Piano, Introduction to Piano Exams, Junior piano exam, Piano exams for beginners, Piano Prep Test, Prep Test. Bookmark the permalink.